Peeling back outdated wall coverings doesn't have to be a pain in the neck! Armed with a few wallpaper removal tools from HYDE, you can tackle this weekend project with ease. No homeowner wants to be confronted with ripped-up wall coverings as a day-in, day-out reminder of a job not yet finished. For this reason, wallpaper removal is a project that should be done in one fell swoop rather than dragged out over the course of a week in odd spare moments. But the sheer scope of the project—imagine four long walls in a high-ceilinged master bedroom—and fear of failure can be just daunting enough to discourage even the most determined homeowner from taking on the project at all. Fortunately, it doesn’t have to be difficult to get rid of that outdated, tired old wallpaper. (And no, we’re not suggesting you run out to hire a professional.) With the proper technique and assistance from the right tools, you can remove even the most stubborn wallpaper on your own and with ease, leaving you free to transform your walls with a fresher, more modern treatment. First, take precautionary measures to protect the flooring and baseboards in the room where you’re planning to remove the wallpaper. Spread a nonslip canvas drop cloth over the floors, then cover up the baseboards with wide painter’s tape. The tape will keep scraps of fallen wallpaper from coming into contact with your baseboards, saving the molding from damage and you from having to unstick the paper all over again. Test just how tightly adhered your wallpaper is by soaking a corner of one panel with some hot water from a hand or pump sprayer. After 10 minutes, peel back the moistened wallpaper. If it comes off easily, you’re in luck! You have strippable wallpaper. All you need to do is spray each panel thoroughly with hot water and give it time to absorb. After a few minutes, peel the panel off. Work on one panel at a time until all are down, then skip to Step 6. 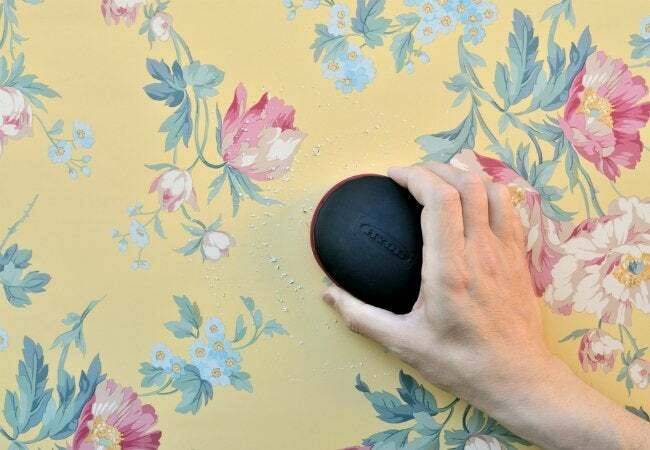 If, however, the wallpaper remains stuck after you spray on the water and wait 10 minutes, you may be dealing with a vinyl wall covering that resists water absorption. Proceed to the next step for the key to tackling your obstinate wallpaper. To better reach the source of the problem—the wallpaper glue—you’ll want to make many tiny incisions in the wallpaper so the hot water will be able to reach and saturate the adhesive beneath. The fastest, most painless way to do this requires one simple-to-use instrument: HYDE’s Wallpaper Scoring Tool. Position the easy-to-grip tool against the wall and move it back and forth in circles and swipes, taking care not to miss the areas closest to the ceiling and corners. With 96 amazingly sharp teeth, HYDE’s Wallpaper Scoring Tool makes wallpaper perforation a snap. After you’ve worked your way around the walls, you’ll see thousands of tiny holes in even the toughest paper. After scoring the wallpaper, spray hot water on the wall; work on only one or two panels at a time so the water doesn’t cool off too much as you proceed through the next steps. Wait 15 minutes for the panel to saturate completely, then peel back a corner to see how easily it releases. Do not despair if the paper resists your tug. If it’s still stuck in the same spot, repeat the spraying process. Depending on the thickness of the glue and how long it has been in place, you may need to apply hot water multiple times in order to loosen the paper enough for easy removal. Are you up against a real challenge? Mix liquid fabric softener—which helps dissolve wallpaper glue—into the hot water at the ratio of 1/4 cup of softener per gallon of water. Dampen your wallpaper panels with this solution as you did with the plain hot water. Once the wallpaper seems loose enough to remove, climb your ladder to start where the wall meets the ceiling. Because loosened strips of wallpaper will naturally hang downward, working from the top down allows you to scrape and peel as you go. For best results, use HYDE’s 4-Inch Glass and Wall Scraper to shave the damp wallpaper from the wall. The blade should be turned to dull side out, instead of the sharp blade which will tend to dig into the wallboard. While no one would fault you for wanting to finish up the project as quickly as possible, use a little caution while you scrape. You may very well be planning on painting the wall after the paper is gone, and you really don’t want to have to fill in nicks and gouges on the drywall or plaster before you paint. To protect the wall, hold the scraper so the blade is nearly parallel to the wall, and draw your tool along the wall carefully. Keep a large noncellulose sponge and a bucket of warm water handy while you’re stripping off the paper so you can scrub down the wall frequently to remove residual glue. This is easier to do while the wall is still wet; once the job is complete, the glue can harden on the wall and require rewetting and scraping. When all the paper has been removed, a final wipe down of the entire wall using the sponge and fresh water is all that’s necessary to prep the wall for its new look. Wait a day for the walls to dry completely, and you can move ahead with either a fresh coat of paint or another style of wallpaper—perhaps one with a timeless design so you won’t have to repeat the project too soon!